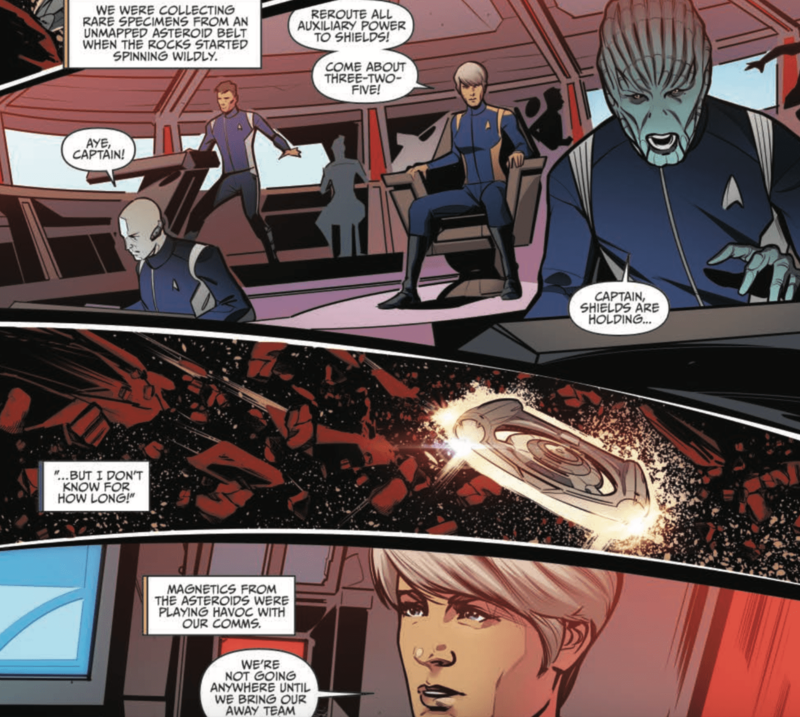 The first Star Trek: Discovery Annual comic hits store shelves today, but we were lucky to get a sneak peek from our friends at IDW. Since December we’ve known the book was going to be about Lt. Paul Stamets and his life before Starfleet, including scenes of his relationship with Dr. Hugh Culber. Anthony Rapp’s excitement was infectious. Then, in January, there were developments on the show (link contains spoilers) that made me feel even more starved for happy Hugh/Paul scenes. When Season 1 of Discovery wrapped up, I found myself counting down the days until March. It’s possible you might not find the comic itself very surprising, either, but it’s a back-story so maybe it doesn’t have to be. 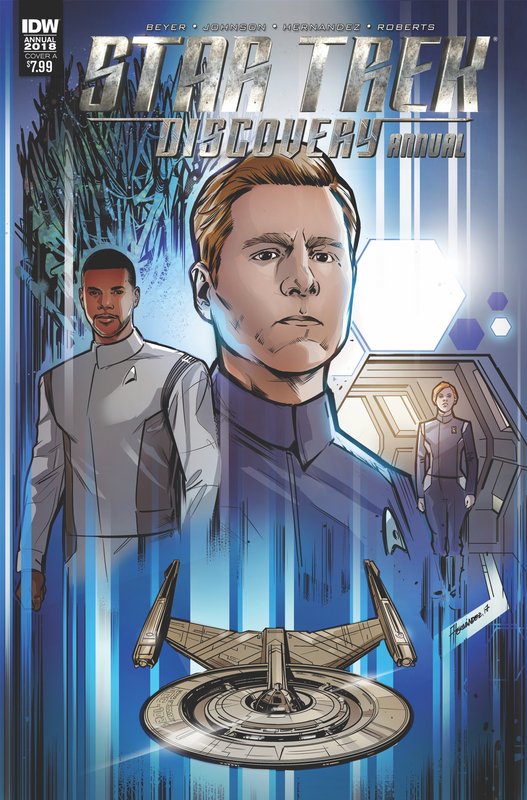 It does tell us how Stamets and his original science partner Dr. Straal discover the mycelial network, how he finally decides to join Starfleet despite concerns they would weaponize his spores, and how he first meets Cadet Sylvia Tilly. The story begins with a Starfleet ship in peril, her Captain and crew trying to retrieve an away team that’s harvesting spores on an alien planet. Even though we don’t learn their names, it’s a dramatic opening to the issue and another effective example of the diversity of the Discovery universe, with a human woman captain, aliens on the bridge, and a racially-diverse away team. But far and away, the best part of the annual is how Johnson and Beyer write Stamets. Through his interactions with his coworkers, with Hugh, and especially with his mushrooms, they portray both his prickly and deeply loving sides. We get to see how obsessive Stamets can get about astro mycology, and how Hugh Culber comforts him and keeps him grounded. It all rings very true to the character development we’ve seen on the show. Also like the show, the moments between Stamets and Culber are lovely and touching, even if they might feel like too few and far between. I would love to read more, preferably Hugh’s background through his own eyes rather than just flashbacks of Stamets. So you might not come away learning anything dramatically new about Discovery in this annual, but hopefully you’ll come away with a smile, remembering why you fell for these characters in the first place. ← Giveaway: Star Trek TNG Cats!